The Refinery Mini Wooden Beer Pong set boasts a beautifully crafted wood design features vintage finish and fun launching catapults. 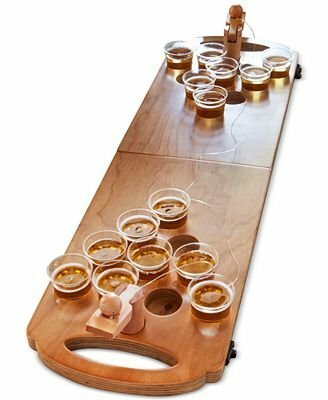 Its custom cup layout allows for strategic re-racks and when you're done playing, the board folds up for easy storage. View More In Pong Games. If you have any questions about this product by Refinery and Co., contact us by completing and submitting the form below. If you are looking for a specif part number, please include it with your message.